Bonnaroo 2012: Who's the Most Popular Band? It's been 48 hours since the Bonnaroo gurus announced Radiohead, Red Hot Chili Peppers, Beach Boys and 82 other acts to jam at the June festival in Manchester, TN. Who's more popular: Bon Iver or Foster the People? Skrillex or Phish? Before, this would be settled the subjective, respectable way: Whoever yelled louder was right. Not anymore! Thanks to Bonnaroo's "custom lineup" feature, which allows fans to tick off which acts they're planning to see, we can now objectively rank, in a highly unscientific manner, the most—and least—popular bands at this year's festival. We've got the Top 10 below, but when you're done going, "Foster the People are more popular than The Beach Boys? 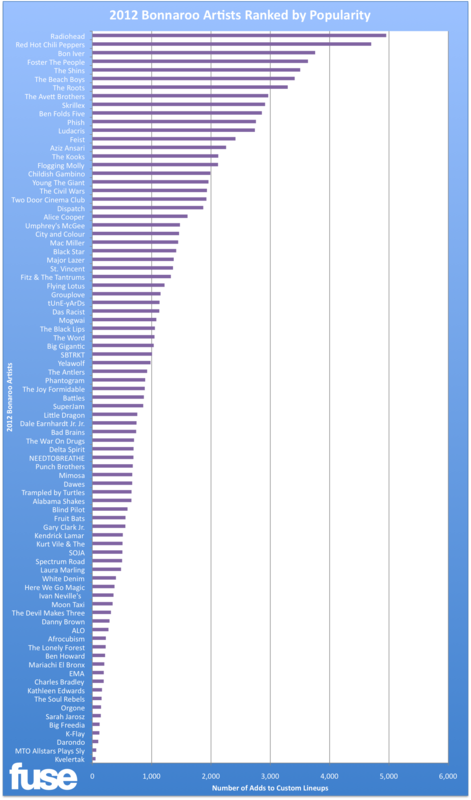 !," check out the full list of 2012 Bonnaroo Artists Ranked by Popularity. Just don't forget that the best bands at festivals are the ones you never plan on catching. The more you know.